Can a Divorce Mediator Really Be Neutral? The simple answer is yes, a divorce mediator can easily stay neutral. The simple why, because they are trained to be sympathetic to the needs of both parties. Divorce mediators are basically trained to guide each of you through a process of advocating for yourself. The goal is to make sure the matters that are most important to each individual are addressed. Concerns such as joint child custody, property, financial matters and more, are each discussed with the mediator, who will lead you both down the path to a peaceful resolution. Divorce is a very emotional time. The process alone of going through litigation typically makes divorce even more costly and nerve-racking. It’s a highly personal action, but the courts handled it in a very non-personal way, so going to court is almost never the best choice. Handling it with a mediator can greatly reduce all that stress. And believe me, the agreements that you two reach together outside of the system will be better than what a judge will dictate to you. With a mediator, you can also put the children first. Saving them the stress of a court room setting is a huge benefit in itself but making the choice to mediate can make the divorce process a much smoother experience for children. You can make decisions with the thought in mind that on the other side of this you will both still be parents. Discussions with the mediator, in a private setting, one on one, also greatly reduce the emotional capital involved. Part of the mediator’s role is to set the rules and the tone of your meetings. Having someone that keeps things civil and focused makes it easier to see what’s important and reach agreements. The mediator helps individuals avoid those unpleasant moments or work through them reasonably. The mediator can also assure that the financial well-being of both parties is taken care of precisely by a Certified Divorce Financial Analyst® practitioner. The CDFA® can demonstrate benefits of specific settlement options and advise clients on the most advantageous property divisions easing the financial concerns. 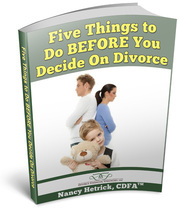 Logical decision making can be difficult if not impossible when you are in the middle of divorce. At such a critical time, avoiding potential financial disaster is crucial. Through professional and proper guidance, the CDFA® and mediator can help ensure financial security for both parties as they move into the next phase of their lives. So, yes, a mediator can be neutral and still help a couple come to crucial agreements that will have a long-lasting effect on the family. Contact us and we’ll help you get started.